An outdoor car cover or indoor car covers work great for their purpose. That is to say; they reduce the damage inflicted on your vehicle. A hail car cover does the same. A hail proof car cover is designed to prevent damage coming from the frozen rain pouring down from the sky. But that’s not all it does. It can also defend your vehicle from elements like rain and UV rays as well as other unpredictable weather conditions. After all, a car hail protector is usually made up of waterproof and weather-resistant material, just like other car covers. It just so happens that these are specially made for hail use. So, if you’re looking to protect your car from hail, you came to the right place. We’ve researched and compiled a list of the best car covers in the market right now that help to protect your car from hail. We’ll be showing you the best car hail protector you can use to shield your car from hail, below. What is an Inflatable Car Cover? What is a Portable Car Cover? What is a Retractable Car Cover? How to Protect Cars From Hail Damage? Can You Claim Insurance for Hail Damaging Your Car? Also, if you want to learn more about car covers and the different benefits you can get from them, read these articles- Best Car Covers and Custom Car Covers. A padded car cover can prove to be more beneficial during hail season since it can offer more protection. But how you know which one is the right car cover to protect your car from the effect of hail? 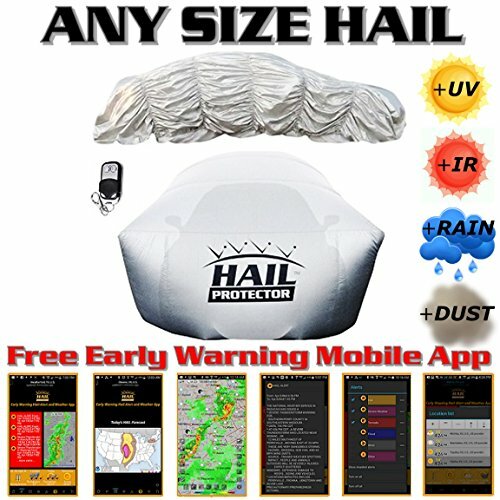 Now, if you’re not the type who likes to read through reviews but want to know which is the best hail blankets for cars quickly, then we’d like to recommend the above three pick. But, if you want to consider all the purchasing options carefully, there are many types to choose from which can take time to find the perfect one for you. If you’re looking for quality products that will give you peace of mind, this hail resistant car cover has excellent durability and can keep your car safe and secure. The Hail Protector is the most recommended hail protective product for cars. It has even been featured on several platforms already. That’s because it’s one of the most effective covers against light to heavy hailstorms. If your place is constantly hit by heavy hail, this product is a must to have! It is available in 6 different sizes and styles so there are more chances that it will fit your car. 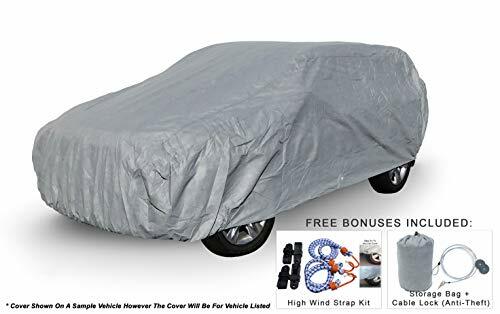 It’s also great as a traditional car cover so you can use it all year round. It has excellent breathability, is heat-resistant, UV-resistant, and even water-resistant. Plus, you only need about 20 minutes for assembly and installation. You have 3 choices for its power sources. Either use an AA battery pack (good for 1 hour), an accessory plug (good for 3 hours), or an AC adaptor (good for an indefinite period). If you don’t need the whole exterior of your car covered (because you might already have a great hail-proof cover for that), then this product might be what you’re looking for. 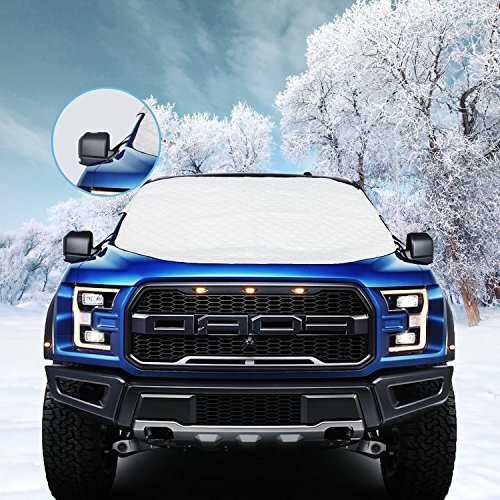 Whether you just want another extra layer of protection or your windshield is the only part left uncovered, this magnetic cover will keep your glass scratch-free. Depending on size, hail is a frozen water pebble that weighs significantly heavier and can deal a massive blow on your windshield. Having a durable cover made of aluminum foil and thermoplastic polymer will keep your glass clear and intact. Plus, the cotton padding will soften any harsh fall making it excellent at defending from light to medium hailstorms. It’s even easy to fold, store, and bring anywhere! The great thing about custom fit car covers is that you know it’ll work well with the actual shape of your car. And the downside? It only works with the specific car model. Anyhow, this one from Coverking also ensures that you will get the best protection since it is made up of four heavy-duty layers of fabric. As such, it’s a great indoor or outdoor car cover choice. It’s weather-proof, meaning this cover can defend from the hottest to the coldest of days. Through sun and storm, it can prevail! It also features impressive neoprene elastics to keep it in place. Plus, its double-stitching design ensures that you will not experience any leaks at all. Now, that’s a good shield for light to medium hailstorms! If you’re looking for something a little bit more durable and long-lasting, a carport like this one is what you might need. This carport is made of highly durable oxford fabric with PU coating. It is tested to be 100% waterproof, dustproof, and windproof. At 170 pounds, you know it won’t get blown away that easily. Plus, installation and maintenance can be done quickly since it only has limited parts. 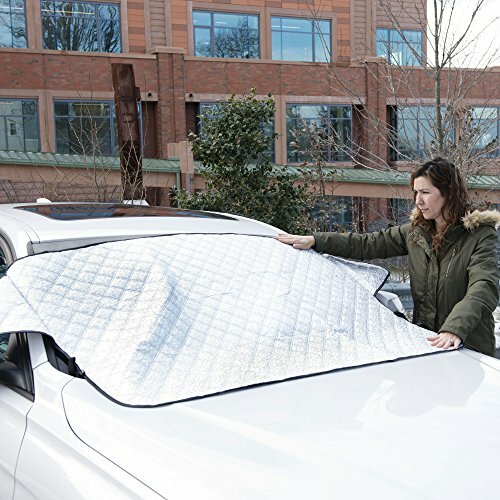 You can safely park your car under any weather without worrying since this cover can protect from sunlight, snow, and freezing. It can even provide a shield against scratching, rust, and of course, light to heavy hail storms. Also, if you want to learn more about the other type of winter cover you might want to invest in, read this article – Car Cover for Snow. Overall, the Lanmodo tent car cover is one of the best car covers for heavy snow. It also works excellently for sun, rain and light hail. Frankly speaking, a hail car cover should provide 360-degree top to bottom protection and this car tent is not. However, if you want the best car cover for snow that can give you greater protection, this product is a perfect match nonetheless. 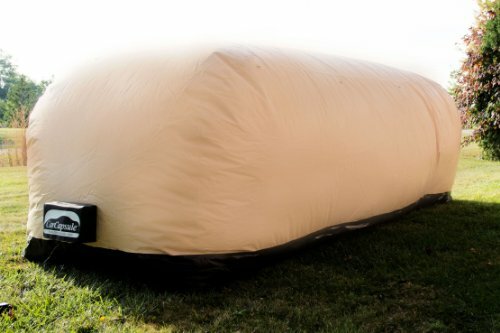 An inflatable car cover is a perfect product to use if you have a lot of open space. This is because it will need more space than the actual size of your car. Inflatable car covers use a fan to keep air circulating inside the bubble it creates, that’s why it’s also called a bubble car cover. Some inflatable covers are see-through since they are a great way to show off your car without getting it dirty. Think of it as a plastic showcase! Other covers, especially the ones for outdoor, don’t offer see-through features since they’re more concerned with durability. Providing more layers of protection is more important to them than being able to show off. The only downside to inflatable covers is that they’re relatively new, and your neighbors would probably laugh at the spaceship-looking blob in your driveway. But either way, it’s a good investment to get! 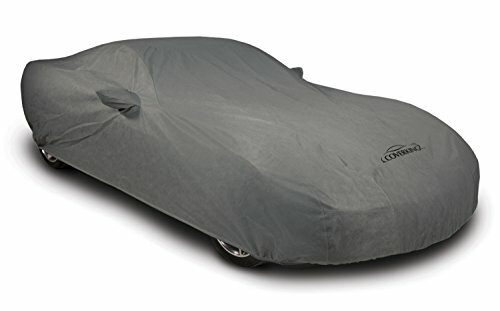 Most car covers sold in Amazon and other shops are portable. This is the usual type of car cover that regular car owners and car enthusiasts know and love. Of course, anything that you can fold is essentially portable, but for this discussion, a portable car cover is your typical full exterior car cover. This type of cover might have the least expensive price out of all the kinds of hail protection covers out there. After all, it’s the most accessible and the most common of all types. It’s also great if you don’t want the inconvenience of assembling and reassembling inflatable and retractable covers. You can also bring it anywhere (even in parking lots!). Just because it isn’t the newest innovation doesn’t mean it can’t protect your car. Some brands of portable covers absolutely can! You just need to make sure that they’re hail-approved, and you’re good to go. If you are looking for carports, here are some of the best portable carport you might want to check it out. Also, to learn more about the benefits of looking at different car cover types and designs by checking out these articles – SUV Car Cover, BMW Car Cover and Covercraft Car Covers. A retractable car cover acts like your own mini-garage. 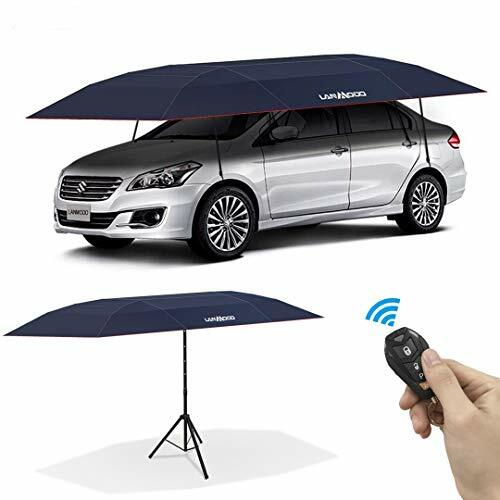 This is very useful if you don’t have a covered area where you can park your ride since it provides extensive protection from your surroundings. Extensive meaning its framed design has more foundation than your typical car cover. You can also categorize this as some sort of carport since it does act like a ‘portable’ car park. 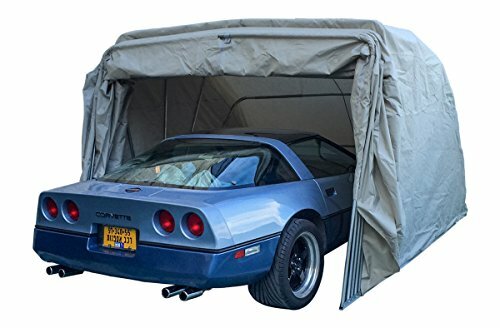 While the retractable car cover is easier to move than an actual garage, its main feature is that you can assemble it in one place, leave it there, and park your car whenever it’s needed. Its framed feature also works great as a hail protector because it is more durable than a regular cover and stops frozen pellets of water better. You’re much surer that this will stay put, and as long as the fabric used is thick and hail-proof, you can protect your car from hail easily. But after all that talk about protecting from hail and hail damage on cars, what is hail? Hail is a natural phenomenon that happens when drops of water formed in thunderclouds freeze. That’s why you experience hard chunks of ice falling from the sky. No, it’s not snow since snows melt as soon as it touches the ground (well, or you). It’s also not frozen raindrops. What’s their distinction? Frozen raindrops fall from the sky as water and freeze as they go down. Hail is already solid before it begins to fall. That’s why they’re more dangerous than your typical snowstorm. Hail can prove fatal to people and can cause substantial damage to properties. Therefore, it’s essential to invest in protective accessories if you don’t want hail scratching your car or worse, cause hundreds of dent marks. So, back to the topic at hand which is: how to protect your car from hail? There are many easy and accessible ways to protect your auto from hail. The most effective is to keep it inside your garage. Having a covered garage and keeping your car there while a hailstorm is ongoing will keep it safe since the roof is sturdy and the walls are harder than frozen pellets of water. But not everyone has access to garages with roofs, so what’s the next best thing? This is the time to invest in hail blankets for cars or carports. Carports are the mini versions of covered garages. They can keep your car safe from light to medium hailstorms. But if you’re looking for something less space-consuming, you can always go with a hail car cover. Car covers specially made to protect from hail will keep your car safe and sound. The only thing you shouldn’t do if you live in a place that encounters hailstorms is to leave your car exposed. There’s a 100% chance that you’ll get scratches all over if you don’t cover it up. If you want to learn more about other types of covers that can protect certain parts of your car, head on over and read these articles – Car Window Covers and Car Dashboard Covers. So you don’t have a hail damage car cover, but you do have insurance. You think you and your car is safe. In some instances, this is true. However, not all insurances cover hail damage. One car insurance policy might have different coverages underneath it. Depending on which state you’re in, the required coverages will differ. There are many more coverages involved in car insurance, but most are either by choice or mandatory depending on your lender. If you only buy an insurance policy that is for liability only, then hail damage would not be covered. But, if you live in an area where hailstorms are frequent, it might be wiser to buy an insurance policy with comprehensive coverage for cars. If in doubt, always speak with your insurance agent to clarify. Hail can severely damage your car so having insurance to fall back on will allow you to breathe easier. But, remember that having insurance doesn’t mean you don’t need to protect your car anymore. A hail car cover is still a necessary preventive step you have to take, though.